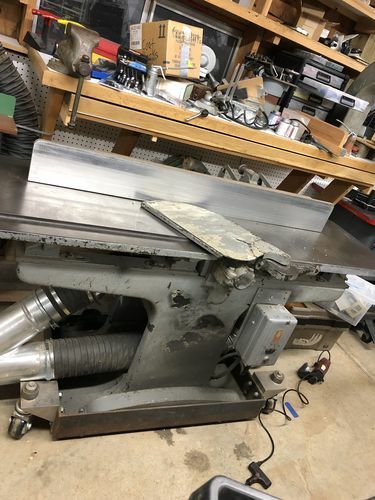 Can anyone identify this jointer? 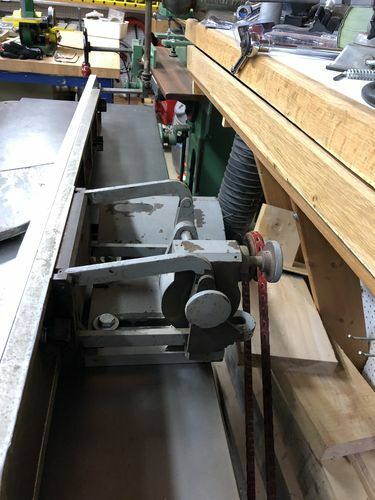 I acquired this 16” jointer some years ago by trading an 8” jointer for it. The guy I traded said this was too heavy and way bigger than he wanted – so lucky me! After some new knives and allot of adjustment it worked great. It has Babbitt bearings that seem in real good shape. I have however never been able to figure out who the manufacturer is. There isn’t a mark or number on it that I can find. It is covered with many layers of thick paint, as you can see some places I have wire brushed down hoping to find some lettering but, no luck. My best guess has been it’s a Crescent, but the sides of the base don’t have the same curvature as most Crescent pictures I’ve seen. Note the sides are much more straight up not curved. 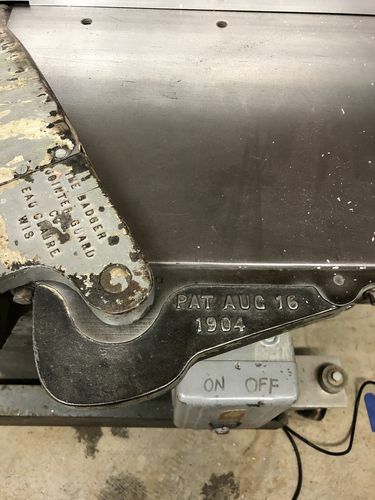 On the top of the guard, there is a stamp that says Patent 1904, but I believe that is only referring to the Badger Jointer Guard Company – not the jointer itself. Notice that I also have bolted a thick piece of aluminum to the fence because the original was a little bent. But you can see the fence better in the picture from the back side. You can spend some time perusing pictures over at the VintageMachinery.org website, under jointers. It has similarities to Jones Superior, as well as Porter, but not identical. Excellent site – but I have already been looking there. However, I am not familiar with every company that made jointers back then so the hunt continues. Other than the non-curved sides of the base it still looks most to me like a Crescent. Perhaps Hall and Brown from St Louis. I think the patent date confirms it. That patent is for the guard, not the jointer. Technically yes, but the info says that the jointer with that language on it was on a hall and brown jointer.